So when is good, good enough for you, your team, and your circle of influence? You might think to yourself, “I’m a good person, I have a good team, and I work for a good company. I live in a good neighborhood, I have good friends, and I make a good living. Things are as good as they’ll be and that’s fine with me.” Sadly, we all too often settle for the mediocrity of a “good life” when there is so much more we can live for. In John 10:10, the Lord tells us that, “the thief does not come except to steal, and to kill, and to destroy. I have come that they may have life, and that they may have it more abundantly.” The only life that will ever really be good enough in this world is the abundant life found in the Lord. He is Jehovah Rohi, the Lord our Shepherd, whom guides us into a life of excellence and abundance that far surpasses any “good life” we can attain on our own. 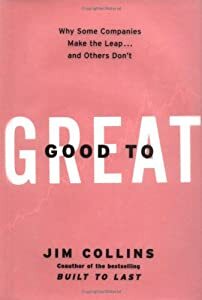 In his book, Good to Great, Jim Collins further elaborates that one of the requirements to turn something good into something great is to “confront the brutal facts, yet never lose faith.” To me confronting the brutal facts means discovering and facing the honest conditions of your life – all aspects – and then doing something about it through a spirit of faith in the One who makes all things new. This process requires a safe environment that offers people an opportunity to be open, transparent, and vulnerable to judge themselves. The Apostle Paul tells us in 1 Corinthians 11:31, that “if we would judge ourselves, we would not be judged”; however, truly judging ourselves requires the ultimate safe environment of eternal Grace, Mercy, and Truth that accepts us just as we are, releasing our past, and creating our future. Facing the facts in the presence of redeeming Grace is the first step to experiencing real change that produces greatness found in God. Concluding, I have an important question to ask. Are you living up to your fullest potential and fulfilling the destiny God has planned for you? It’s not just a good question, it’s a great question that you must ask and honestly answer to become all that God intends for you to be. With a spirit of faith, don’t ever settle for the “good life” when the Lord is “able to do exceedingly abundantly above all that we ask or think” in Him! The Make It Happen Moment ® Face The Facts Copyright 2006, The Make It Happen Learning Institute. You have permission to reprint The Make It Happen Moment ® Face The Facts, in its entirety only, and forward to your colleagues and friends, provided the copyright notice remains part of the reprint and transmission. All other rights reserved.